The bend in the west passage of Knowth,contains a wonderful collection of engraved stones. 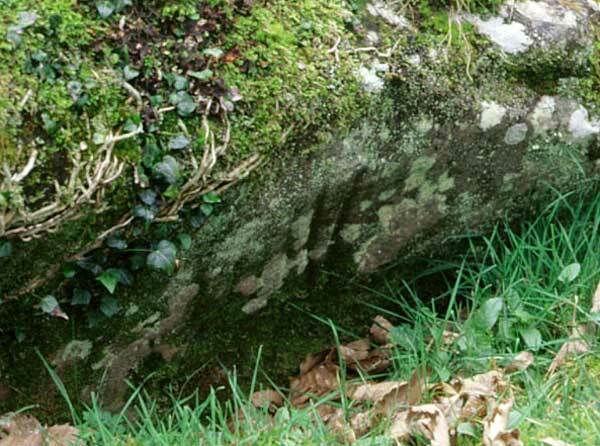 One of the best known features of the Irish Passage Graves are the neolithic engravings, a mysterious symbolic language that ornaments many structural stones, especially in the Boyne Valley and at Loughcrew in County Meath. 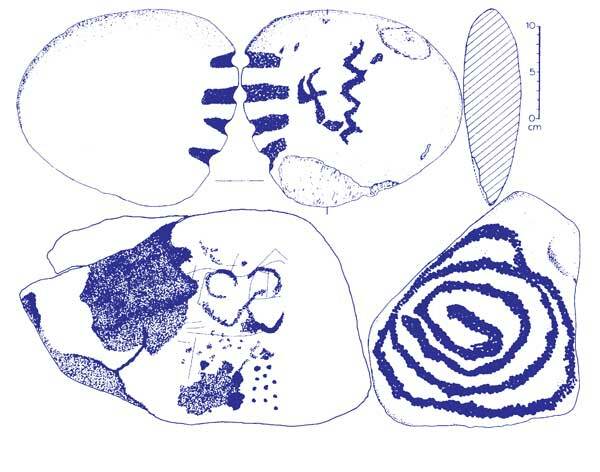 These engravings may be considered the earliest writing or inscription in Ireland, carved by descendants of the first colonizing farmers who landed in County Sligo around 4,150 BC. It is now accepted that the early farmers migrated to Sligo from Brittany, an area with a long tradition of monument building with megalithic art found at sites such as Gavrinis, Kercado and La Table des Marchands. 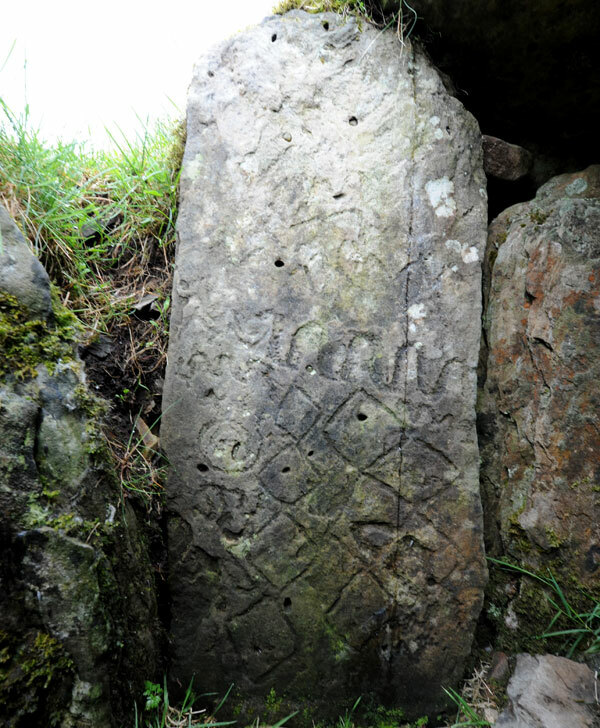 A number of early carvings have been found in the western sites of Carrowmore and Carrowkeel. Art was noticed at Listoghil, the central monument at Carrowmore, by tour guide Michael Roberts, which was subsequently published by Patricia Curren Mulligan. The engraving consists of three joined arcs or 'rainbows' carved on the right edge of the huge capstone. To the right of the arcs there is a double ring with a dot at the center. American rock art expert Martin Brennan visits Carrowmore 51 in County Sligo. The art is digitally highlighted; it is only visible during sunny afternoons during midsummer. Because the carving is on weathered limestone, it is difficult to see with the naked eye; however, it can be viewed at noon during the summer months when the sun is directly overhead. This monument, dated to around 3,600 BC, has an astronomical alignment towards the sunrises and moon rises over the peaks of the Ballygawley Mountains six kilometers to the southeast. The modern reconstruction has restricted the view to a few days in late October and early February. 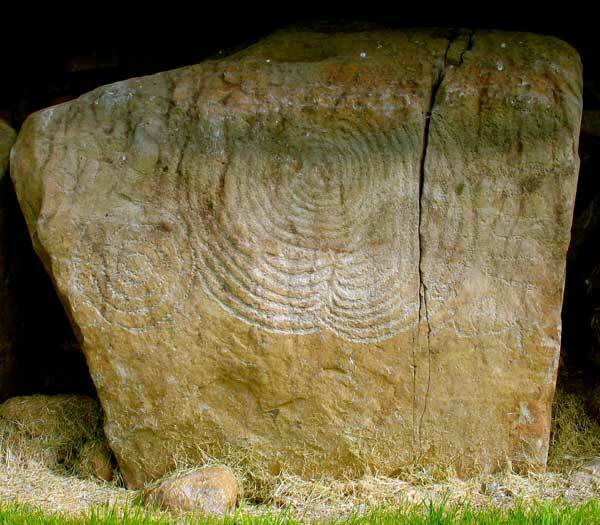 Modern researchers believe that the carvings at Cloverhill belong to the late Bronze age Iron age and are probably contemporary with the carving found within the chamber of Listoghil, which was carved with an iron chisel. Two more examples of megalithic art were discovered in recent years, one on a kerbstone at Heapstown, the huge unopened cairn at Lough Arrow, the other in the chamber of Cairn B at Carrowkeel. Kerbstone with engravings at Heapstown Cairn in County Sligo. 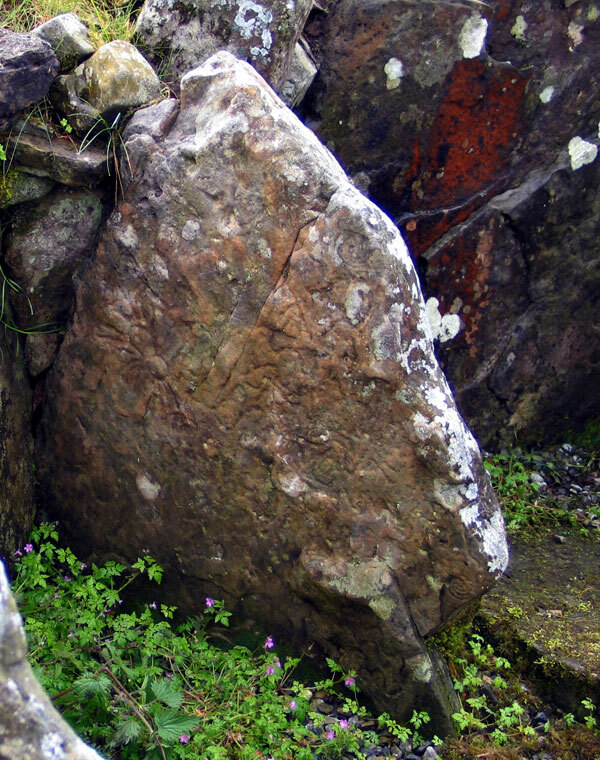 The discovery of megalithic art at Heapstown, made by the author in the late 1990's was not surprising, as there were rumours of a stone bearing art having been removed from the cairn during quarrying. In some versions the stone was carved with ogham, a script much later than the megalithic art, and stood at the summit of the great cairn. However, the illustration of the designs was drawn by Vincent Dodd in his report for the National Schools Folklore Collection in the 1930's has all the hallmarks of genuine megalithic art. Engravings at Heapstown Cairn in County Sligo. Illustration by Vincent Dodd, National Schools Folklore Collection, 1930's. The remaining carving is found on a south facing kerb stone and consists of a number of parallel lines, which may indicate that the as yet undiscovered entrance to the monument is close by. As a result of these new finds there is now megalithic art known from all	four	major	passage	tomb	complexes. 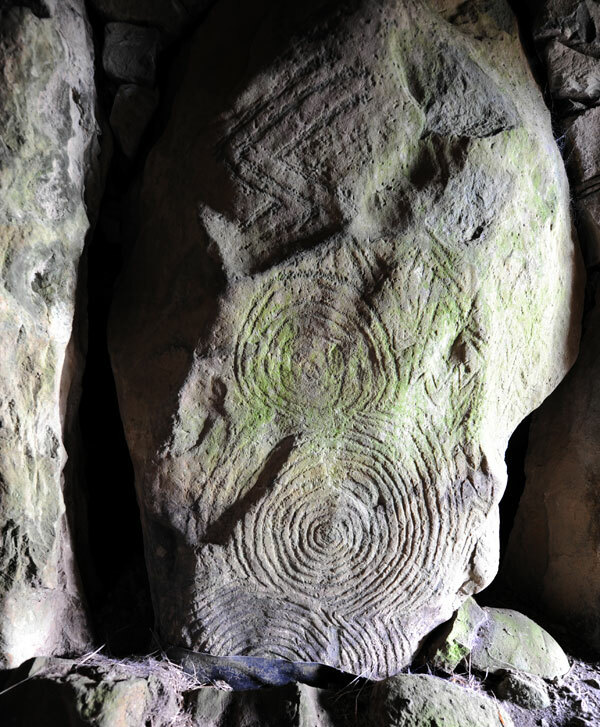 While	there	seems	to	be	a tradition of making megalithic art at passage tombs in County Sligo, it would be wrong to expect large undiscovered quantities of art in the north-west. 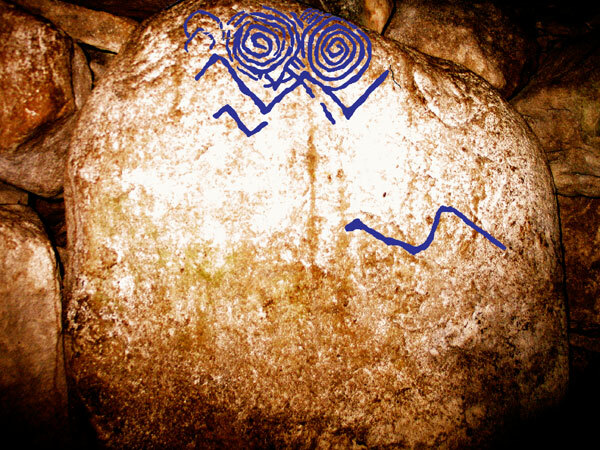 The authors carried out a two-week search as part of the	Carrowkeel	Passage	Tomb	Art	Project	at	many	other	passage tombs	in	the	Carrowkeel-Keashcorran	complex	and	a	number	of other passage tombs in the region, and the second stone in cairn B was the only additional art found. It is likely, however, that more art will be discovered in the west in time. The possible use of pigments to	make	colored	motifs	and	designs	might	also	explain	the	smaller quantities of carved art on passage tombs in the west. Evidence of the use	of	colour	has	recently	been	discovered	on	the	parietal	walls	at Barnenez	and	Gavrinis	passage	tombs	in	Brittany,	France,	and	at	the Neolithic Ness of Brodgar site in the Orkney Islands. It may be that similar evidence will one day be found on the walls of passage tombs in	Carrowkeel	and	on	Neolithic	monuments	elsewhere	in	Ireland. But that, as they say, is another story. Conclusion from Once Upon a Time in the West. 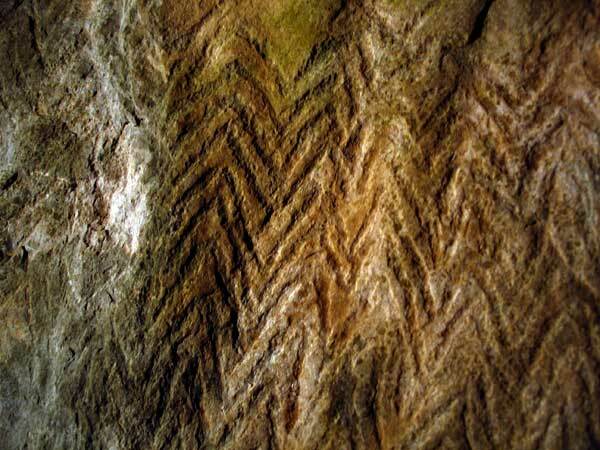 Neolithic art discovered in 2009 within Cairn B at Carrowkeel County Sligo. There are several other examples of megalithic art to be found at isolated monuments in the mid north of Ireland. The large chamber at Knockmany in County Tyrone has a fine collection of six engraved stones, now covered by a strange glass structure for the protection of the art. 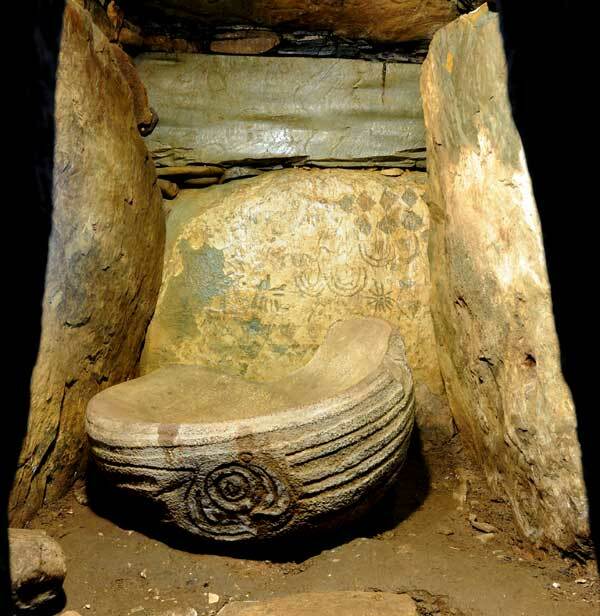 The chamber is five meters in length and opens to the south, quite possibly aligned to Loughcrew 80 kilometers away. Details of the engravings can be viewed at the Megalithic Art Analysis Project page, which also has details on accessing to monument. Another engraved monument is found close by at Sess Kilgreen, where apparently the carvings have eroded badly from exposure to weathering. 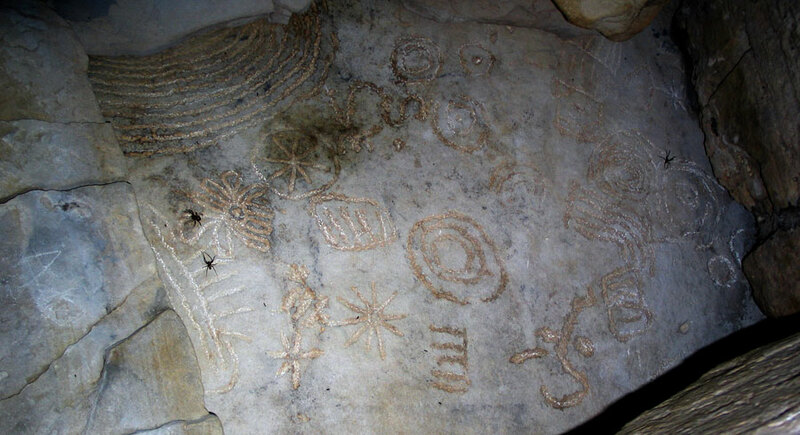 These engravings may well deal with ritual astronomical themes, demonstrated at several sites where the artwork is illuminated by the light of the sun or moon at a chosen time during the cycle of the body in question. The Great Basin of Knowth. 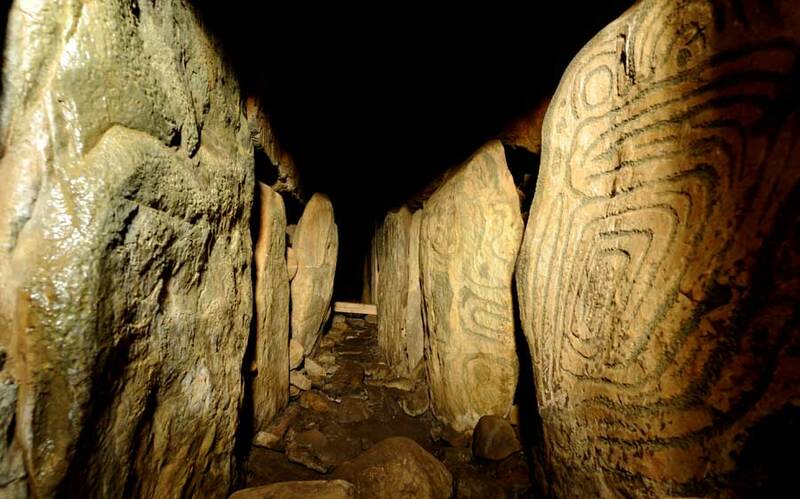 When it comes to megalithic art, no other place in Ireland can compare to County Meath, where there are more engraved stones than the total for Western Europe. 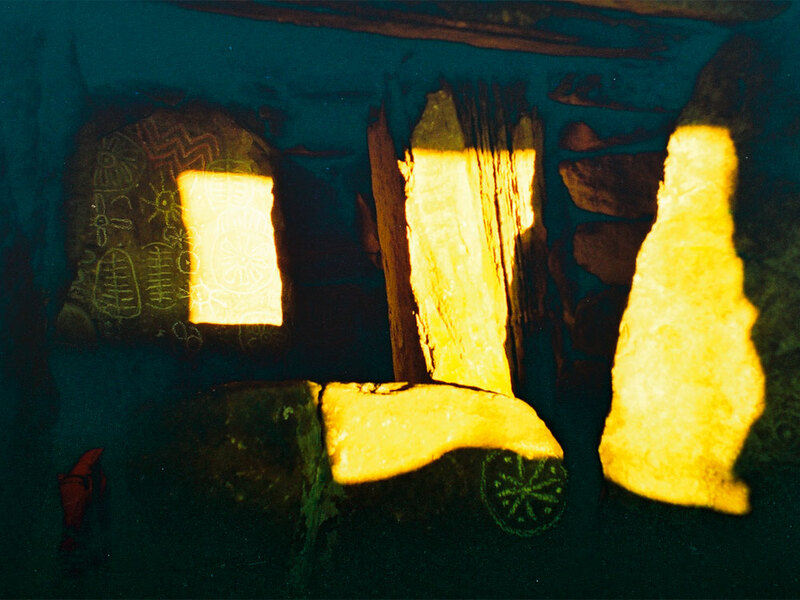 Equinox sun illuminates megalithic art at Cairn T in Loughcrew. Later in the same sequence. 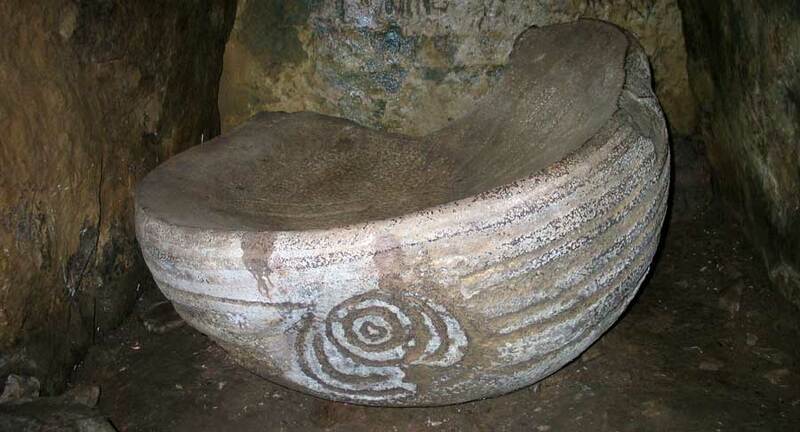 Knowth alone has 50% of the engraved stones in Ireland. 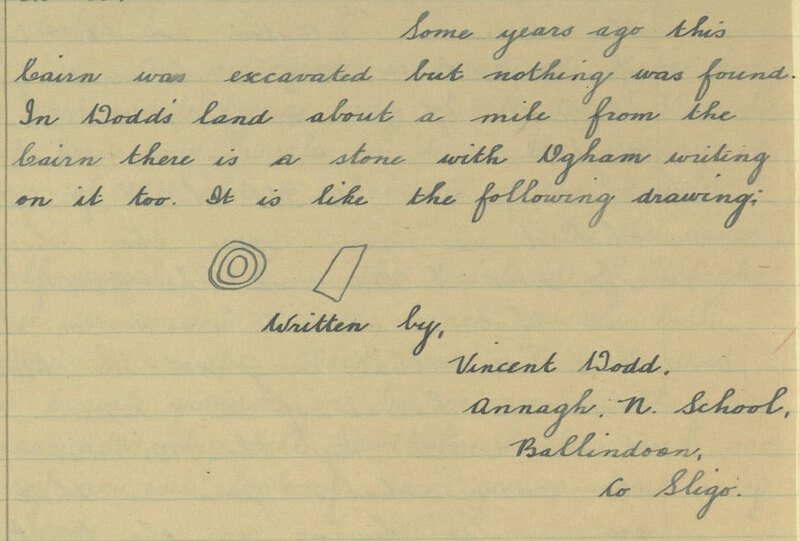 Early engravings have been discovered in recent years on the chamber of Listoghil monument at Carrowmore in Co Sligo. 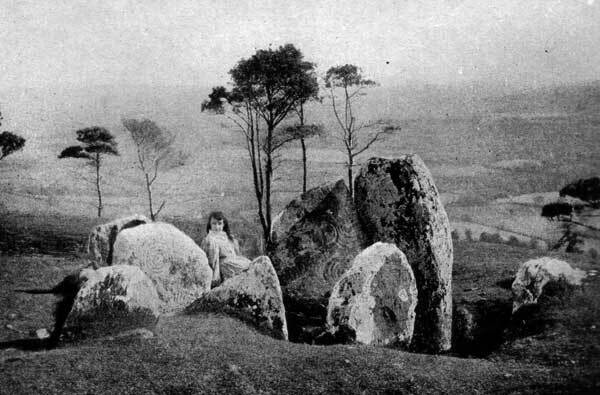 Heapstown Cairn, also in Sligo is known to have had several engraved stones, with perhaps an ogham stone standing at the top of the mound. Only one stone remains visible today, as many were robbed from the site in the last century. 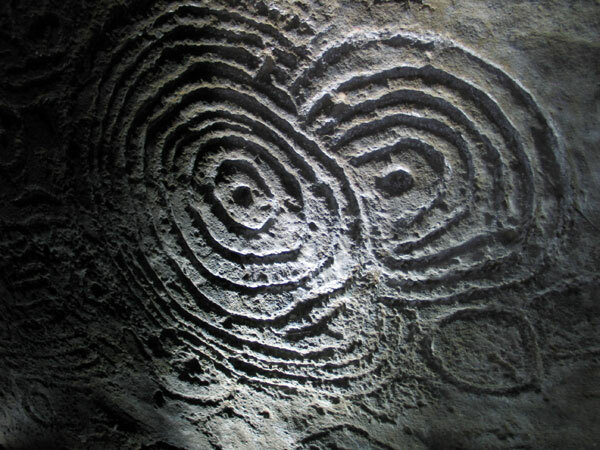 The cosmic designs within the right recess of Cairn L at Loughcrew has echoes of the pattern on the huge basin within Knowth east. 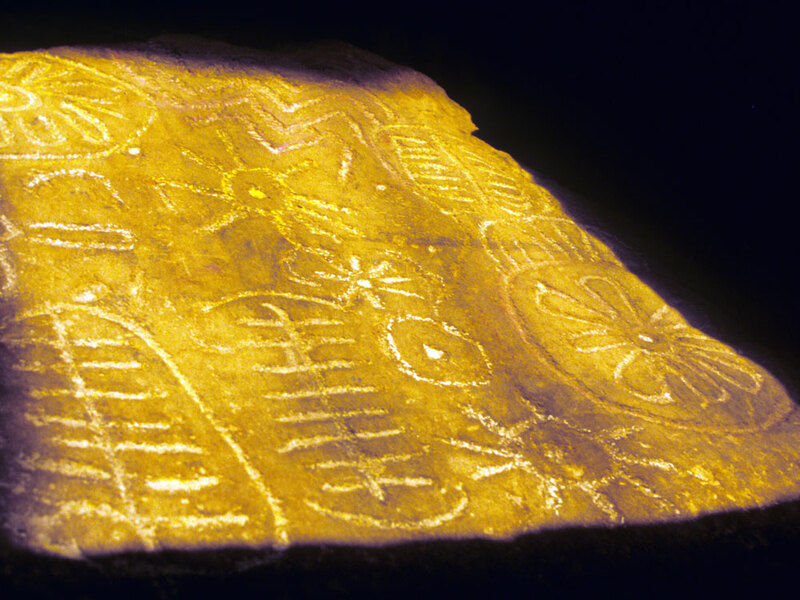 Decorated cairn stones from Newgrange. Few designs are known in the west of Ireland and some other scatters sites such as Knockmany and Sess Kilgreen in County Tyrone. 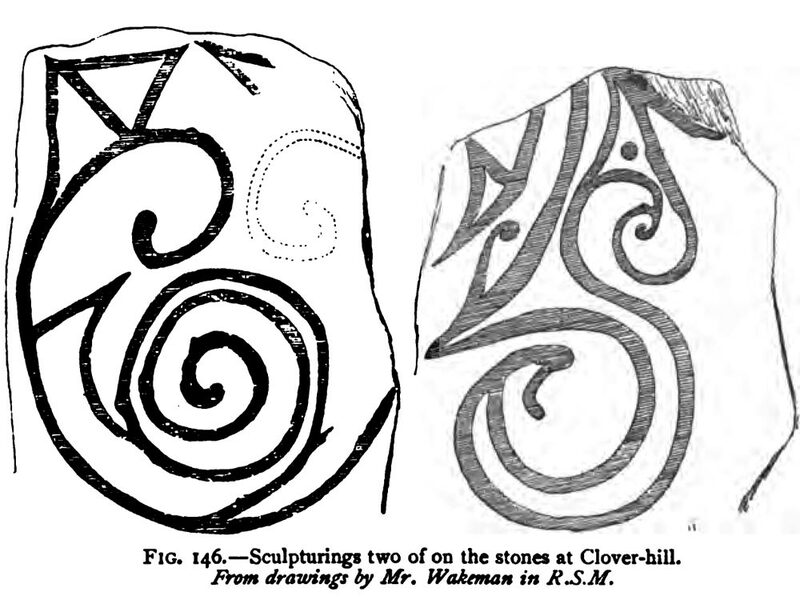 Loughcrew, just within the west boundary of County Meath has many engraved stones, of a type that seem rougher and earlier than the art of the Boyne Valley. Many of the engravings are badly weathered from long exposure to the elements, while those that had shelter are as fresh as the day they were engraved more than 5,000 years ago. Loughcrew retains two fabulous alignments where the rising sun illuminates and interacts with the panel of art at Cairns T and L.
Decorated stone in the mid left recess of Cairn I at Loughcrew. The rain helped show up the art. Note the vivid red blotch on the stone behind - the result of weathering? Neolithic art on a passage stone within Cairn F on Carnbane west. Zig-zags, undulating waves and diamond shapes, the latter thought to be ancient units of land measurement by researchers Martin Brennan and Michael Poynder. The so called Guardian stone or Owl man at the bend in the passage of Knowth west. The neolithic art is deeply scratched, probably by the later medieval graffiti artists who left at least 20 ogham names on the stones of Knowth. Large and beautiful panel from a roof stone in the passage of Knowth east. 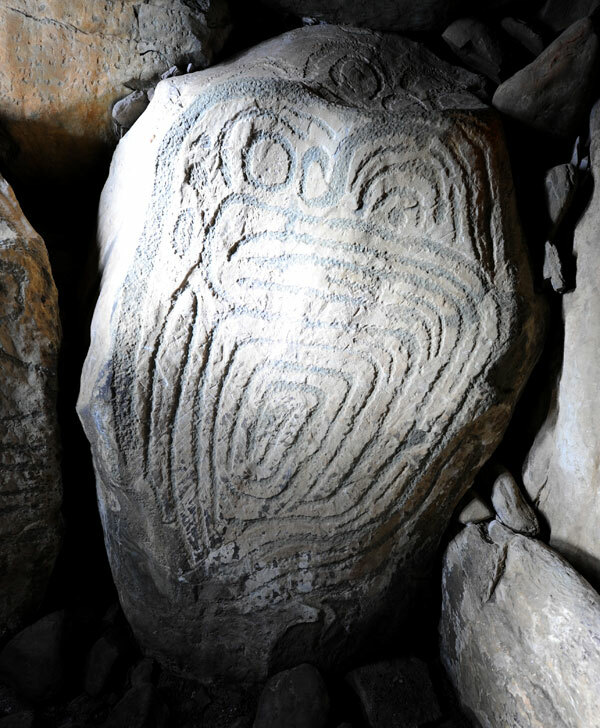 This stone was found lying in the medieval ditch that encircles the mound of Knowth, and was restored as a passage stone during the 'restoration'. This kerbstone from Knowth may be a representation or diagram of the nearby mound at Newgrange. The elaborately decorated roof stone in the end recess of Cairn T at Loughcrew. Note the spiders and the eight-spoked designs. This panel is brightly illuminated by reflected sunlight on the equinoxes.